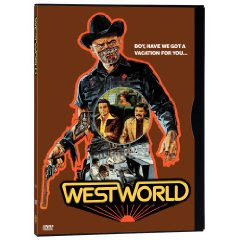 Michael Crichton's WESTWORLD. Are any of you out there familiar with this movie? It came out in 1973 and is written and directed by the author himself. I was a bit skeptical about this one at first, but I picked it up on DVD a few years ago and I was not disappointed. In fact, I just watched it for the fifth time the other day, and let me tell you, it holds up well to repeated viewings. You see, in these amusement parks, everything is robotic but extremely life-like, right down to the animals. Interested humans may choose between three theme parks: West-world, Medieval-world, or Roman-world.......you can do anything you want, you can became king, sheriff, take as many women as you want, rob banks, have duels, kill as many people as you desire....you get the drift. All weapons have heat sensors so you will not accidentally harm another human....and it is next to impossible to tell the humans from the androids. The action centers mainly in West-world, with two buddies wanting to live it up in the wild west, but you also see glimpses of the other theme parks. The movie starts as an awe-inspiring fantasy that you could easily lose yourself in. In fact, you start to feel right at home watching people's follies and adventures in the three parks. But things suddenly begin to take a nasty turn. You see, the androids are malfunctioning and they begin to brutally murder the people they are supposed to entertain! Watch in horror as the androids wreak havoc on the human race!! And there's no way to stop them because the computers that control the parks have crashed! Will anyone make it out alive? What if the androids make it to the outside world? You should drop everything and get this movie now!! And if you have seen this movie, I would love to get your feed back on it.....feel free to leave a comment.